This entry was posted in Algeria, Austria, Belgium, Brazil, Bulgaria, Byelarus, Canada, China, Egypt, English, France, Georgia, Germany, Hungary, India, Indonesia, Iran, Israel, Italy, Japan, Morocco, Netherlands, Poland, Portugal, Romania, Russia, San Marino, Spain, Sweden, Switzerland, Tunisia, UK, Ukraine, USA on May 13, 2013 by Larysa. This entry was posted in Dutch, Netherlands on April 20, 2013 by Larysa. 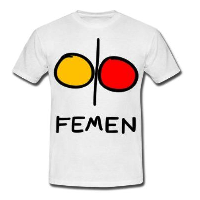 This entry was posted in English, Netherlands on September 12, 2012 by FEMEN. This entry was posted in English, Netherlands, Ukraine on December 10, 2011 by FEMEN.